Extra MSA are a newer operator introduced in the 2000s. They run their services like shopping centres, letting facilities out rather than franchising them. In the past this has created an usual line-up of brands but now it tends to be a mix-up of familiar names. With an estate of new-build services all of a similar design with a large glass building, they are the only operator to have all of their services located off a junction. 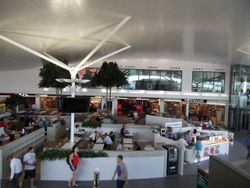 Extra came about after the government deregulated motorway services in the 1990s in order to encourage more competition. Before building any services themselves, Extra leased out the petrol stations at Winchester and Tibshelf, Roadchef's newest services at the time. Extra's first site was Cambridge on the A14 in 2001 and by the time it opened they already had several planning requests pending. Described as "posh" by the press, they had the advantage of watching the shortfall of the big three operators and insisted that they would not use franchises, instead creating their own brands to keep the prices down. Strictly speaking this was true, but mostly they've leased units to others have chosen to franchise. They also said many of their units would become conference facilities. In 2003 Extra bought two services from Margram, and in 2007 Gold Star services were finally branded as Extra. This, coupled with the addition of Derby with Burton and Leicester, and the proposed services at Folkestone, Beaconsfield and Cobham, would have created a fairly large estate. In 2008 Extra were put up for sale, with Macquarie Bank (owners of Moto) and James Packer (who was actively involved with Welcome Break) being the two most promising bidders. 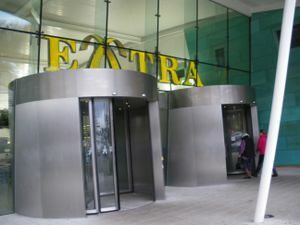 After 9 years of growth, Extra fell into administration between March and October 2010. Since then, several services appear to have reduced their ties with Extra. When it was rescued from administration the non-motorway services were sold off, while self-run facilities were replaced by units let out to catering providers and rival operators (as opposed to self-run facilities branded as a franchise, which is what most other services do). Extra's newest services are large, but still similar to their previous. In 2015, plans for three new services - all older ideas which hadn't been pursued - were developed. Their rekindled enthusiasm for building new services comes following a period of quiet stability, where trade at Beaconsfield and Cobham made up for their large investments and Extra began to recover from the burns of less successful projects. These new services tend to perform well in Transport Focus and VisitEngland's surveys. Extra have always used the 'cross' symbol pictured above, which if you look carefully has motorway lane markings on it. Long after the other operators, in 2009 Extra started putting brand names alongside their own on road signs in an attempt to get extra customers. Names usually include Starbucks, M&S, Greggs and McDonald's.